Color-blocking and neon: it doesn’t get better than that! The latest looks coming off the runway are fun and flirty, with shocking neon colors and lots of color blocking for a slimming effect. I love that you don’t have to shell out big bucks for the latest styles; more mainstream retailers are doing justice to the color-blocking with their latest looks for fall. 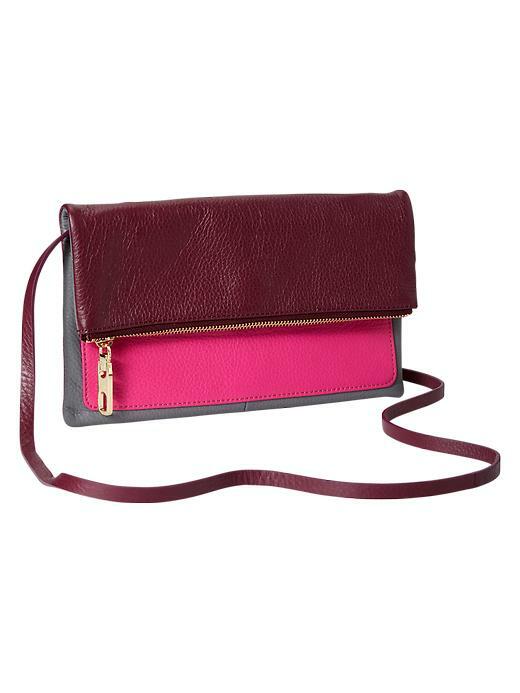 Check out this awesome leather cross-body bag from Gap. It has all the key elements of a fashion statement – a pop of color, balanced shape and size, and functionality. Described as having a ‘soft-grained finish with color-block pattern,’ the bag comes in a few color combinations, and best yet, is priced affordably, on sale now for $43.96. If it’s too small to hold all your must-haves, check out Gap’s Vertical-stripe tote or Horizon-stripe tote. These tote bags hold true to the trend of a base neutral color with neon color-blocked design. They also are available in a few color combinations to go with your favorite scrubs. These bags are the perfect accessories to the new line of Smitten scrubs. Targeting the young, hip nurse who knows her fashion, Smitten scrubs rock out with hospital-compliant colors and a touch of neon for a pop of color. Zippers, drawstring ties, and t-shirts lend a burst of fun to these junior-fit scrubs. The neon pink in the Gap bag brings out the pink in Smitten scrubs, making it the perfect accessory that is both practical and style expressive. Try Smitten top S101003 for a well-fitting scrub top with contrast stitching detail. You can also read about a first-hand look at the new Smitten scrubs at hello-anna-and-mo.com, in a review written by nurse blogger Anna Rodriguez. Don’t let work-place dress codes limit your options, express yourself with the perfect bag!